I was offered this story from the publisher, unaware until the end that it was a companion book to A Certain Slant of Light that was published in 2005. After reading Under the Light, I absolutely want to pick up the first book to learn more about some of the characters that I read about in the second book. What an interesting, quirky story. I felt lulled, pulled along, enchanted. The first part of the book is mesmerizing: a boy and a girl leave their bodies and meet in a vast field, somewhere. Jenny left her body (she had already practiced once or twice) during a particularly humiliating episode with her parents. Last thing she knew, she was sitting in the Prayer Corner, reading pages from her diary out loud. Her father thrust the torn-out pages to her and insisted while her mother said nothing. Jenny finds that she can travel around anywhere by just wanting to go, though sometimes she ends up places that she had not pictured. Then one day, as she is in the field, a boy comes out of nowhere. She is intrigued, especially since he can see and speak to her. And touch her. They play a game, holding hands and traveling together. Then one day, he starts to fade. He says that she can’t come with him. He tries to tell her his name, where he lives, but she can’t hear him. Then, suddenly, for the first time in months, she is back in her body, in the tub, surrounded by pill bottles. Her mom is calling. Billy, a boy she barely knows, breaks down the bathroom door. What’s the Deal? : When Jenny is out of her body, another spirit has taken over, one who had met another spirit that was occupying the body of a boy that goes to school with Jenny. They spirits, Helen and James, fall in love, but since spirits are ethereal and cannot touch or be touched, Helen needed a body. She borrows Jenny’s form when Jenny leaves it. Feeling guilty after Jenny returns to her body, Helen leaves her James and comes to help Jenny. Helen wasn’t the most upstanding of caretakers when she embodied her, especially since Jenny’s family is very religious and strict. Helen wants to make things right before she goes to rejoin James. As Jenny struggles to remember her missing months, deals with a change in her family and tries to learn more about Billy (who has some weeks that he has forgotten, too), she starts to find her place in the world, in her own way. The Bottom Line: This story is both heartbreaking and joyful. About letter go, but reclaiming what’s yours. It is constricting, limitless, a burden, a release. Enjoy. 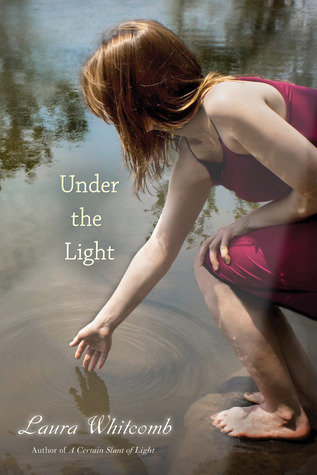 Under the Light by Laura Whitcomb will be published tomorrow by Houghton Mifflin Books for Children. A free copy of this book was given to Ink and Page in return for an honest review. Big thanks to the Publisher/the Author.